Delightful vintage inspired tiered skirt with rik-rak detail. 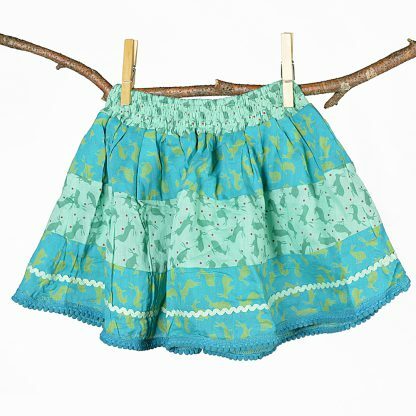 The skirt has a stretchy elastic waist and little pom-poms along the hem. 100% cotton. Fully lined. Machine wash at 40 degrees. 100% Cotton, machine wash at 40 degrees. Available in mixed Rambling rose prints, Vintage rose prints, Hare prints, the order of the fabrics may vary due to the nature of the design. In Sizes: S/M (age 2-4) length 26cm; M/L (age 5-7) length 32cm.